Thanks to higher than expected revenues, the State of Illinois ended the last fiscal year with a backlog of unpaid bills that was about $900 million below earlier forecasts. The bill backlog stood at $6.8 billion on June 29, 2018, the last business day of the fiscal year, which ends on June 30. That compares with a previous projection of $7.7 billion by the Governor’s Office of Management and Budget (GOMB). 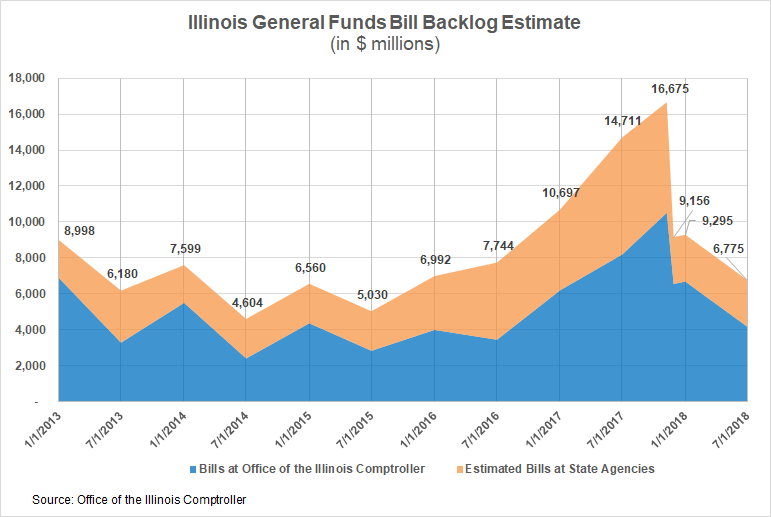 The following chart shows Illinois’ General Funds backlog from January 2013 through June 2018, based on numbers from the website of the Illinois Comptroller’s Office, which are used for GOMB’s projections. It should be noted that the numbers on the Comptroller’s website are slightly different from that office’s Debt Transparency Report summaries. The Debt Transparency report summaries include certain group health insurance claims pending at the Comptroller’s Office that are not included in the website numbers. The backlog surged during the two-year budget impasse that began in July 2015, as State officials failed to agree on a plan to address the drop in revenues caused by the automatic rollback of temporarily increased income tax rates. The peak of $16.7 billion occurred on November 8, 2017, after which the State cleared out about $8.7 billion of the bills using the proceeds of a $6 billion bond sale and related federal reimbursements for State Medicaid spending. The bond sale was authorized by the FY2018 budget, which increased income tax rates and ended the budget stalemate. As previously discussed on this blog, the State collected over $900 million more in general operating revenues in FY2018 than previously forecast, according to a recent report by the Illinois General Assembly’s Commission on Government Forecasting and Accountability (COGFA). The State brought in $248 million more in income taxes than expected, which has been attributed to federal tax changes. Transfers were above projections, largely due to $198 million in additional payments from the Capital Projects Fund to reimburse General Funds for capital purpose debt service costs. Sales tax receipts of $7.8 billion were $141 million below forecast amounts. Federal revenues deposited in General Funds, which relate mainly to Medicaid reimbursements, were $614 million above projections at $4.0 billion. To the extent that federal revenues were higher than expected in FY2018 because Medicaid bills were paid more quickly than anticipated, then those revenues will be deducted from projected FY2019 receipts. According to the Comptroller’s website, the backlog stood at $7.6 billion as of 8 a.m. on August 3, 2018. Because the number reflects a point in time, it fluctuates based on revenue collections and bill payments. There is currently no plan to clear the remaining backlog except through budgetary surpluses. The FY2019 budget projects a narrow surplus of $11 million, but even that amount relies on certain aggressive assumptions.